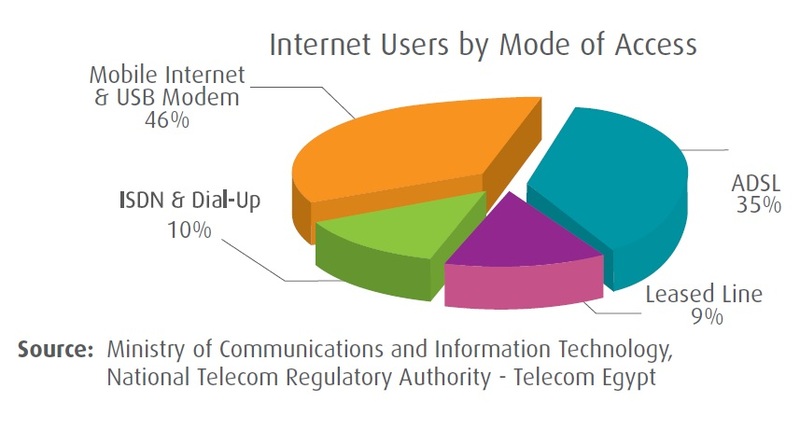 The latest ICT indicator (August 2012) has revealed that 31.2 million internet users in Egypt are accessing the internet through 2 millions ADSL lines and 3 million USB modems, Nearly half of the Egypt internet users (46%) are able to access the internet through connected mobile devices and USB modems. One would think that 38% internet penetration rate must be a great step to achieve full internet coverage in Egypt, but surprisingly enough, it’s not. 46% of the internet users are connected through USB modems, and another 10% are still connected through dial up. In reality, if someone did the math one would realize that at least 17 million out of 31 million internet users in Egypt have limited internet access. The problem is, this majority of internet users are limited to a maximum daily / monthly bandwidth. This means that the users are not able to watch many youtube videos, they are not able to download movies or music, they are surfing the internet with fear of finishing their pre-paid credit or their limited quota. But here is another thought you can’t locate the physical address of these internet users to help building websites that are location aware. It also means that you can’t target these users by city or area to deliver more relevant ads. We should find ways of making the internet accessible, really accessible, without crazy costs, and without fears from using your quota, and definitely without the unfair “fair” usage policy. It all starts with designing and building the right infrastructure which we are a way behind in taking the right steps to build.